The concert’s lineup could not have been more star-studded, featuring a hit parade of the era’s marquee acts, from Chuck Berry and the Beach Boys to Marvin Gaye and the Rolling Stones. Piercing incessant screams from the audience, Lesley Gore ran through a string of bubble-gum anthems. And James Brown, the concert’s explosive showstopper, would later claim it was the moment white America finally discovered him. If you’re of a certain vintage and grew up in New England, perhaps you remember the Barbarians, a short-lived garage-rock band out of Provincetown. They peaked at No. 55 on the charts with “Are You a Boy or Are You a Girl’’ in 1965 before disbanding three years later. Otherwise, you have to wonder how such a fledgling band ended up immortalized in “The T.A.M.I. Show,’’ a concert film considered the first of the rock era. It’s a fabled document in the history of early rock ’n’ roll but one that has lived on mostly through word of mouth, high-profile fans like Sting and Quentin Tarantino, and subpar bootleg copies. The show — “T.A.M.I.’’ was short for Teenage Awards Music International — was recorded in 1964 at the Santa Monica Civic Auditorium in front of an audience of largely white teenagers. Its prestige has grown over the years, yet somehow the film never made the leap to home release after its run in theaters. That’s all the more reason to celebrate last week’s official DVD debut of “The T.A.M.I. Show’’ on Shout! Factory, which restores a long-lost classic with high-definition quality and reminds the world of Cape Cod’s first big shot at rock stardom. Either way, the release of “The T.A.M.I. Show’’ has put the Barbarians back in the spotlight. It was the last thing Moulton, who’s 65 now and runs a cleaning company, expected after appearing in the film 46 years ago. 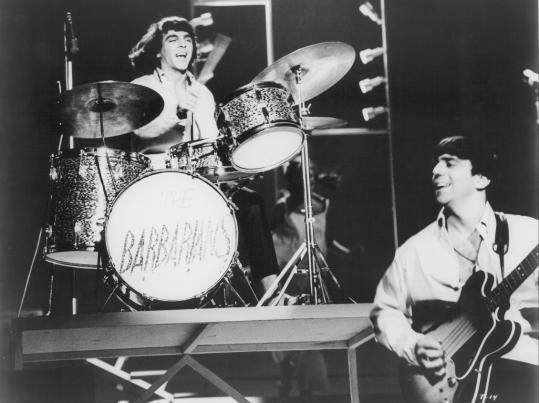 While the other artists got four or five songs, the Barbarians are seen for just one, “Hey Little Bird,’’ but it was a solid performance, especially for a band that had been together for only four months at that point. And then there was the curious sight of a 19-year-old drummer playing with a hook. Moulton lost part of his left arm in an accident at age 14. His hook is featured prominently in the film, but its director remembers some initial hesitance. He’s not a full-time rocker anymore, but occasionally Moulton plays with a new set of Barbarians. And with renewed interest courtesy of “The T.A.M.I. Show,’’ Moulton says there’s not much talk of the original lineup reuniting. Still, he’s intrigued by the prospect of releasing his own music again, and his bank account wouldn’t mind, either: “My royalties are so small now, I can’t even buy a cigar with them,’’ he says, only half in jest. Speaking of the hook, does he still have it?